Put them in a bathroom. 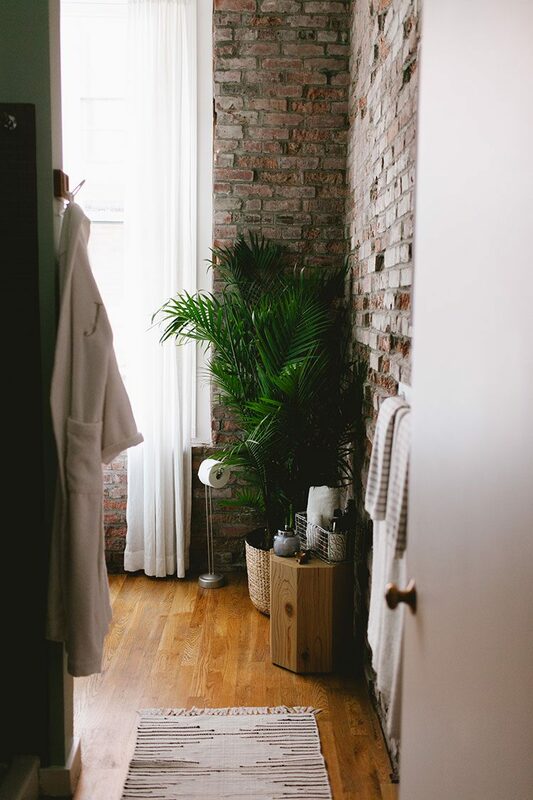 When I lived in a loft, the bathroom was the BEST place for tons and tons of indoor plants, especially big ones! They seemed to love the humidity. Plus, houseplants clean the air, so having a few in the bathroom is a great idea. Just imagine taking a relaxing soak in the tub and your view being an indoor jungle! Use them to conceal switches, thermostats, outlets, etc. 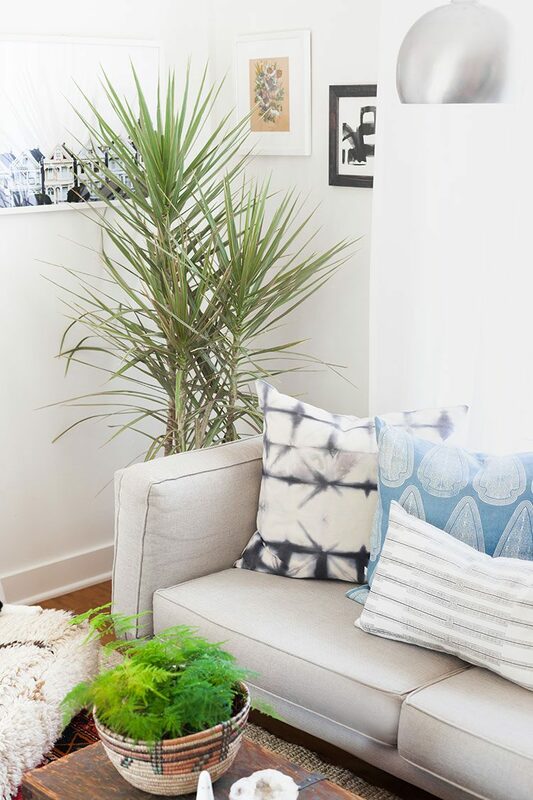 If you’ve following the blog for a while, you may have noticed that my dracaena tree moves around (as evidenced in the 2 photos of it in this post!). That’s because I love to use it to cover up anything that isn’t photogenic or stylish like a light switch or outlets. Currently I’m using it to hide our thermostat! 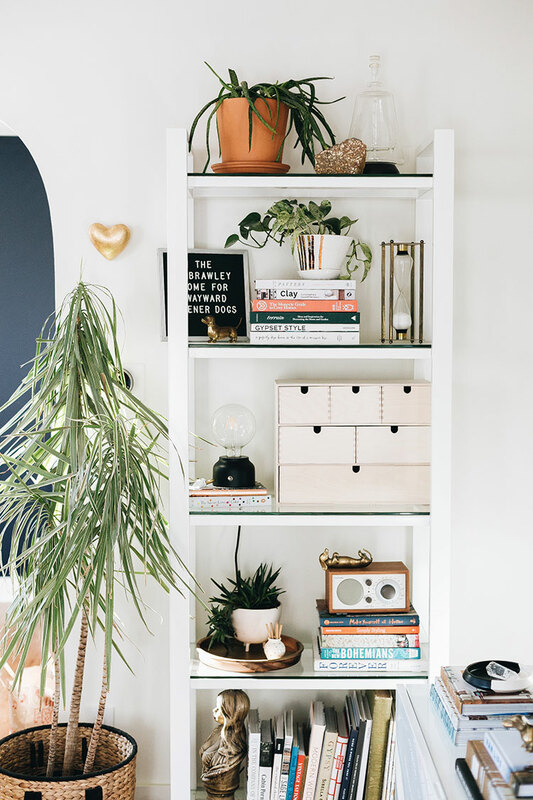 I feel like smaller homes have a tendency to have weird, awkward corners and nooks… but that’s just an opportunity to add more plants! 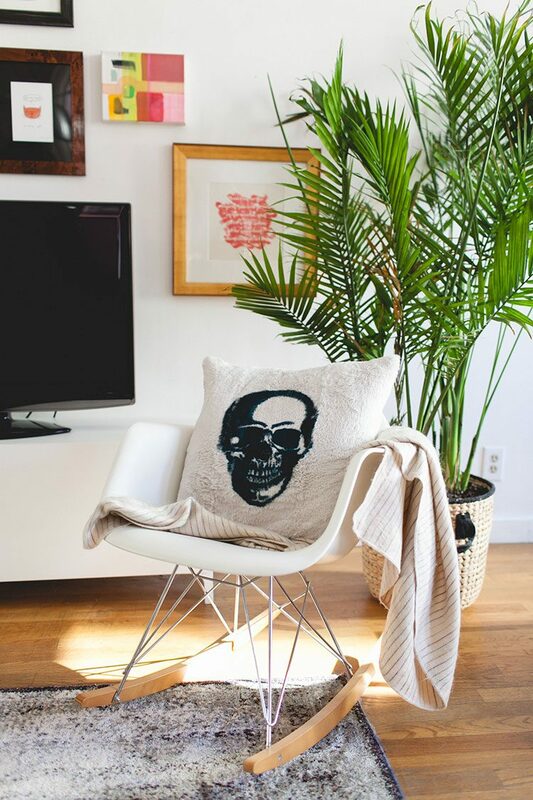 A large houseplant can help anchor the room, create a focal point, and add texture. Don’t be afraid to splurge on a statement-making garden pot and fill it with a leafy, tall beauty. Then stick it in that awkward corner. Voila! Instantly, your space feels balanced and way less weird. Think of them as art. Having too many accents in a small space can feel overwhelming. A gallery wall and a grouping of large plants? Mayyybe too much. Instead, shift your mindset and view your houseplants as art instead! Put them by a mirror. To maximize your tall houseplant’s impact, try positioning it near a mirror. This will help the plant to look even bigger and more lush! This is an especially good hack if you’re on a budget. Use them to add privacy or create separate in a room. 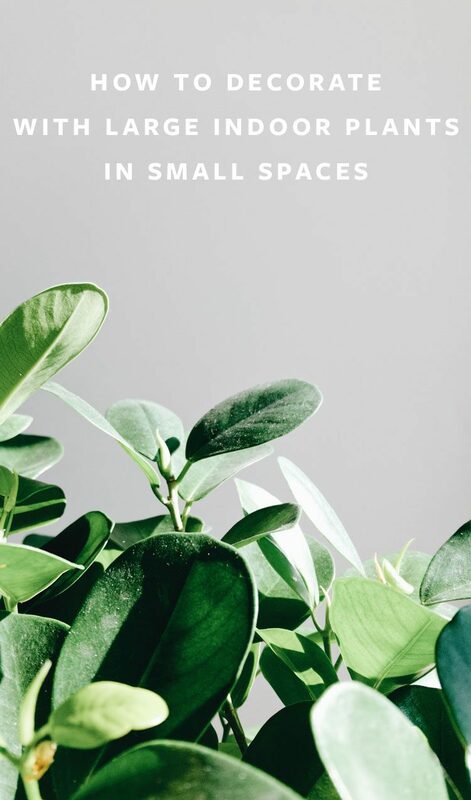 A grouping of large plants can easily help lend a touch of privacy, especially if you live in a loft or studio apartment. Group 3 or 4 large, potted houseplants together instead of using a room divider or screen. It’s like a living plant wall! I also have used large plants as a visual separation between spaces when I lived in a loft. My majesty palm helped divide the space between my living and dining areas. 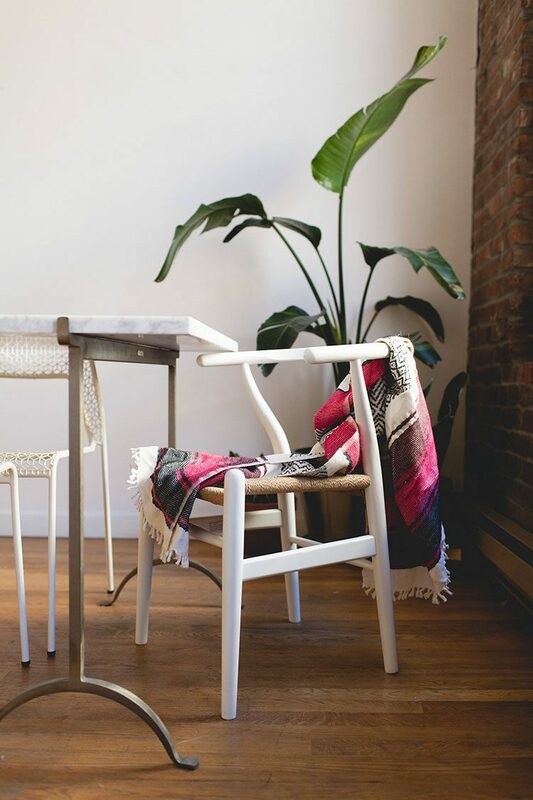 Which large indoor plant is your favorite and where does it live in your home?